I found the Scotch Ale to have the following characteristics. Appearance: Deep cherry with a lot of foam and good lacing. Aroma: Sweet, malty with a subtle hint of hops. Taste: Very mild with a slightly bitter finish. The Sam Adams Scotch Ale is not quite as thick and full flavored as some Scotch ales but this was a surprisingly good beer. I don’t think I’ve ever seen this one before!! But I think the Sam Adams Samplers are my favorite way to get Sam Adams, since most of the beers I can’t quite handle for a full 6-pack. I think the sampler packs are a great way to taste a part of a brewer’s spectrum of beers. You might try a beer and think it is terrible and if that happened in a bar or with a six pack you might swear off a brewer. With a sampler pack you are bound to find a few good beers and may come to appreciate a brewer in a new way. I like the Sam Adams sampler in particular because they roll out their seasonal collection (Old Fezziwig, Noble Pils, Holiday Porter, White Ale, etc.) and their brew masters’ collection (Black Lager, Scotch Ale, Revolutionary Rye, Boston Ale, etc.) 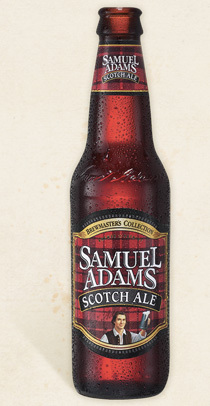 while including their tried and true (Boston Lager, Sam Adams Light). I’m always a little hesitant with Sam Adams, some of their seasonals are great. Others… So I’m glad to let you taste first. Thanks! Will be trying. More than happy to do the dirty work. I am just that committed to my fellow dancers.